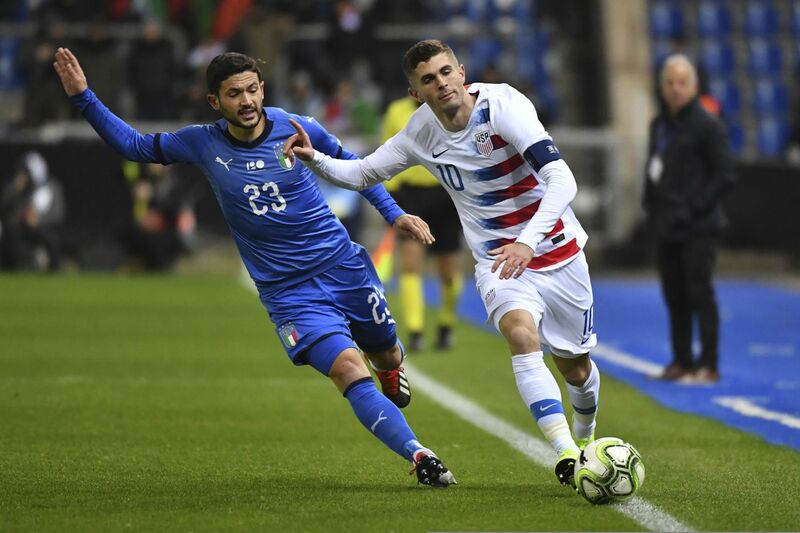 DAVENPORT, Fla. (AP) — Christian Pulisic has a vision of a transformed U.S. soccer team, a red-white-and-blue power that gives opponents sleepless nights similar the nightmares that plague players on the eve of facing Brazil or Germany. The midfielder from Hershey, Pennsylvania, is with the national team this week for the first time since he became the most expensive American player. Chelsea agreed in January to buy Pulisic from Borussia Dortmund for 64 million euros (then $73 million), then loaned him back to the German club for the rest of the season. In their first training camp with new coach Gregg Berhalter, a trio of emerging 20-year-olds could start together for the first time: Pulisic, Weston McKennie and Tyler Adams. "There's a lot of things that we talk about, that we need to be leaders, we need to show everybody what we're about," Adams said. "A lot of times I feel that in the U.S. we talk about how many good young players we have and stuff like that, and there's a lot of players that end up falling off or not being heard about again. And you don't want to be one of those players." Pulisic was 17 when he made his Bundesliga debut in 2016 and became a regular with the national team. When the U.S. lost at Trinidad and Tobago in October 2017, failing to qualify for the World Cup, he was the image of defeat. Pulisic crouched on the field, steadied his body with his right hand and covered his face with his left. The emotional pain was intense. "Ever since that happened, it makes you want to be in a World Cup that much more," he said. "So, yeah, definitely it motivates me." A regular with Dortmund the past two seasons, he struggled with a torn calf muscle last fall and a thigh injury this winter. He lost his starting job to 18-year-old English winger Jadon Sancho. Pulisic's start against Hertha Berlin on Saturday was just his sixth in the league this season, but he scored as a sub against Stuttgart on March 9, his second league goal this season and first since September. He played in both Champions League round of 16 matches against Tottenham, though he struggled to be effective in the first leg. "I feel very confident right now," he said. "I'm feeling very good. I feel like I'm at the top of my game. So I want to play as much as I can over there over in Dortmund. I'm not there to just finish out my time. I want to fight and they know that." Chelsea wanted to acquire Pulisic during the January transfer window because it anticipated discipline from FIFA, which in February banned the club from signing players for the next two transfer windows. FIFA concluded the team violated regulations on the registration of young players, a penalty the Chelsea has appealed. Pulisic long dreamed of playing in the Premier League, the most watched soccer league on U.S. television. Chelsea needs a playmaking midfielder in case Eden Hazard leaves this summer. Knowing his time at Dortmund will end in two months does not make Pulisic feel awkward. "My teammates are all professionals," he said. "They understand how this business works. I wanted to move and they're all very happy for me and the club is, as well." After starting the season with 12 wins and three draws in its first 15 matches, Dortmund has two losses and three ties in its last nine games. After opening a seven-point lead in early February, it is tied with Bayern Munich atop the Bundesliga at 60 points with eight matches left, in second place on goal difference. Dortmund last won the title in 2012 and is seeking to end Bayern's streak of six straight championships. "We started off so strong, and unfortunately I've had some injuries kind of on and off throughout the season, which has been a low point for me," Pulisic said. "I've been working on that and trying to keep myself healthy for the rest of season. ... Obviously I'm super-excited to be there the rest the season and fight for the title." While Dortmund uses Pulisic as a wide player, Berhalter envisions him as an attacking central midfielder, paired with McKennie.